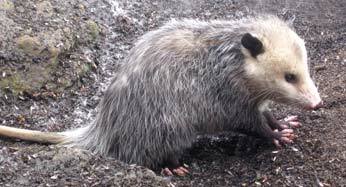 Gray fur covers most of the Virginia opossum’s body; its pink ears, feet and tail have little to no fur. On average, it’s about the size of a house cat. It is the only marsupial in the United States, which means it has a pouch for its young like a kangaroo. This animal can be seen in the evening and lives in a wide variety of habitats, including forests, farmland and open woods, with a preference for wet areas like marshes and streams. This animal can be seen in any Summit Metro Park. Ever hear the phrase “play opossum?” The phrase refers to the way the opossum plays dead when frightened. This is a behavioral adaptation, which causes the opossum to roll over, drool with an open mouth and become stiff. The trick can fool predators into thinking the opossum is dead, and they’ll move on for a fresh meal. The coyote is grayish to rusty brown in color and sometimes shades of off-white. It is about the size of a medium-sized dog. The body is lanky in appearance. The tail is bushy and typically held downward at a 45-degree angle from the body. This nocturnal animal can adapt to almost any habitat. In areas where human threat is low, they may be seen out during the day. This animal can be seen in any Summit Metro Park. Both the female and male coyotes play a role in caring for the pups. 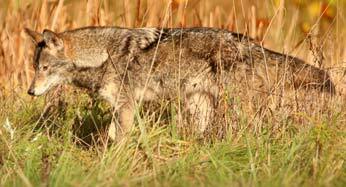 Coyotes walk on their toes, or “tip-toe,” which is called digit grading. The coat of the white-tailed deer can be seen in two different colors. Its summer coat has a reddish tint and is brownish gray in winter. When frightened it will lift its tail, flashing the underside, which is a silent warning to the rest of the herd that there is trouble. White markings can also be seen under the throat, around the eyes, under the belly and down the inner legs. Antlers can be found on the male “buck,” which are grown throughout the year and shed after the breeding season. 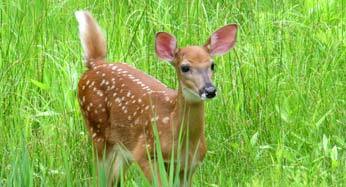 The female “doe” and its young do not have antlers. This animal can be seen in any Summit Metro Park. It is active during the day, but on the move at dawn and dusk. Antlers are the fastest growing tissue in mammals. Genetics play a role in how they grow; however, nutrition plays the biggest role in the growth of the antler. Roughly the size of a house cat, the striped skunk has short legs and is low to the ground. Its fur is shaggy and black in color. A “v” marks its back in white, serving as a memorable marking for predators. As an omnivore, this animal eats insects, frogs, small mammals, fruits, grasses, nuts and carrion. Skunks are active during the warmer months. They are nocturnal, spending the night being most active, but will occasionally venture out in the daylight to find food. 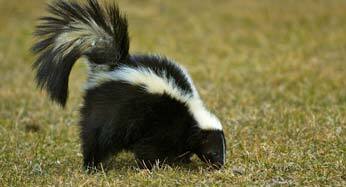 Skunks can spray accurately up to 15 feet, which helps deter predators. Nevertheless, the great horned owl feeds on them. Despite its name, the black bear can be other colors including chocolate brown, cinnamon brown, blue-black and even white. Males are an average of 300 pounds, and females average about 175 pounds. The black bear is omnivorous. The black bear is crepuscular, meaning it is most active at dawn and dusk. It prefers wooded habitats. This animal has been spotted at Liberty Park. 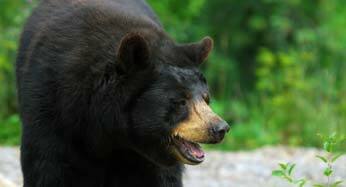 Black bears were eliminated from Ohio in the 1850s. In 1973 a report of a female “sow” and cubs was recorded. Males have a home range of 100 to 120 square miles, while females have a smaller home range of 24 to 50 square miles. A black bear female raises young alone and reproduces every two years. This mammal’s body has mostly brown fur; its underbelly can be grayish-brown in color. The wing tissue is brown and wingspan is about 8.7 to 10.6 inches wide. Its fleshy brown ears peek out of the brown fur atop its head and are extremely important for echolocation, which is how the bat catches insects for food. The little brown bat is nocturnal. At night, it spends its time flying in the air catching food. This animal hibernates in the winter, and since most migrate, it will not be seen until warmer months. Before White-nose Syndrome, this bat was common in each Metro Park. 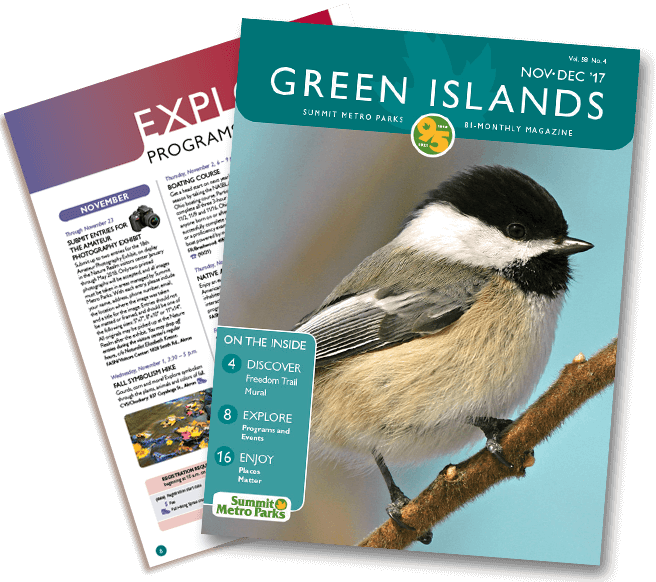 Recently, they have been harder to detect and currently reside in Sand Run Metro Park, F.A. Seiberling Nature Realm and Liberty Park. 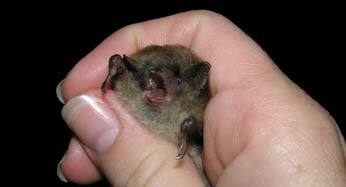 Little brown bats can eat hundreds of insects per hour.